Love the breakfast—ton of choices of food. Room is clean, staffs are friendly. Only complaint is WiFi, too slow and constant off. View from pool is wonderful! Phuket is an island that sits off of the southern coast of Thailand. With its white-sand beaches, delicious cuisine and luxurious resorts, Phuket is the perfect slice of tropical paradise. With Orbitz.com, you can book the best Phuket hotels and find deals on flights to Thailand. Most of the hotels and resorts on Phuket are clustered in the Patong area, which spreads around a beautiful bay on the western side of the island. In Patong, you will find a wide selection of bars, restaurants, souvenir shops and tour companies. Because most of the tourists to the island make their way to Patong at some point, it is easy to locate English-speaking people who can help you find your way around the island. 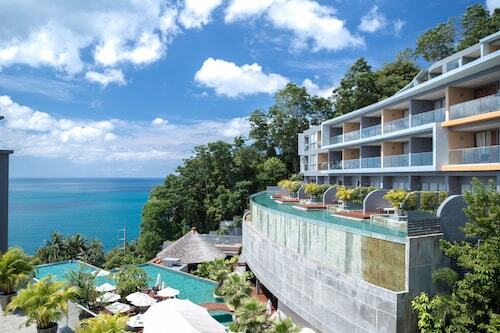 One of the most beautiful accommodation options in Patong is the Amari Coral Beach Phuket. This stunning resort is located on the southern edge of the bay, so it is secluded but still within a few minutes of the main part of town. 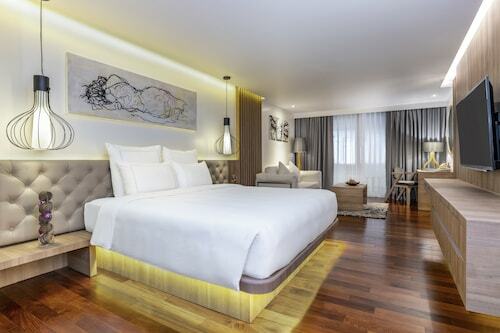 The hotel offers luxurious guest rooms furnished with traditional Thai furniture and art. The rooms and the hotel’s lounge areas have gorgeous views of the bay, which are particularly spectacular at sunset. During your stay, you can relax on the hotel’s private beach, enjoy water sports or have a meal in the onsite restaurant. Room rates start at $102 per night. Call the hotel to learn more at (+66) 76-340-106. 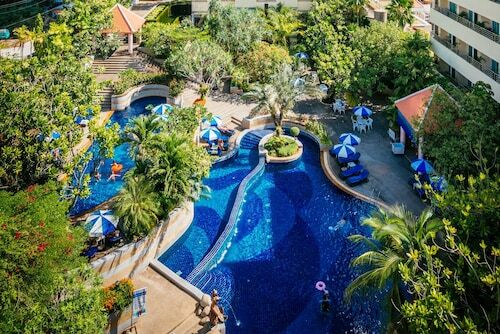 Nearer the center of town, another comfortable hotel is the Thara Patong Beach Resort and Spa. This hotel is located just steps away from Patong Beach and the town’s best nightlife, so you can be in the center of the action in minutes. The luxurious rooms, outdoor pool complex and onsite spa ensure that your vacation will be relaxing. All of the hotel’s rooms have private balconies. Rooms start at $72 per night. To learn more, call the hotel at (+66) 76-340-135. If you prefer to find your own private slice of island paradise away from the crowds, check out Sa Khu. This neighborhood is located near the airport in a quiet, mostly residential area. For an unforgettable retreat, book a room at the Indigo Pearl Resort. The resort is decorated in a dramatic style, with Thai accents at every turn. From the beautiful outdoor pool to private cabanas on the nearby beach, you can enjoy the sun in complete luxury. The hotel offers suites, private villas and private cabanas, some with private plunge pools. You can relax in the onsite spa, enjoy gourmet meals or book local tours with the hotel concierge. Each room has comfortable beds, bathrooms and Internet access. Rates start at $157. Call the hotel at (+66) 76-327-015 for details. Whether you are coming to Phuket to relax in luxury or experience the Thai culture, you’ll find a wide range of entertainment options to fill your time. From lazy afternoons spent on the beach to adventurous jungle hikes, the island offers something for every type of traveler. When you book Phuket hotels with Orbitz.com, you can find great deals and manage your reservation details. I love the service! It was our one year anniversary and they decorated the room so lovely! We kept getting surprises at the door, first a bowl of fruit, then a beautiful cake that said happy anniversary! We didn't want to leave the resort to explore at all because everything there was great. The restaurant staff was amazing. Our waitress Kook was sooo kind, she even remembered us the second time and remembered our room number. From bartender, to lobby staff, to restaurant staff amazing service and genuine kindness! Would stay here again and highly recommend to anyone! Thank you Kalima! Its perfectly located either for the beach goers or if you want to explore the city. The Swissotel has all the amenities one could ask for on a relaxing vacation.